From January 2005 to September 2009, the city's Maynard C. Stiles Waste Treatment Plant on North Second Street reported 1,170 overflows in which a total of 23 million gallons of raw sewage leaked into city streets, yards, and the Mississippi River and its tributaries. In addition, a sewage line broke in April 2008 and leaked 45 million more gallons of sewage over a 25-day period. Memphis faces a possible lawsuit for violations of the Clean Water Act and is working with the Environmental Protection Agency to remedy the problems. City plant discharges sewage into local rivers and streams; environmental group threatens lawsuit. The Mississippi River is famous for its muddy appearance, but dirt isn't the only brown stuff lurking in Memphis' portion of the river. The city-run waste treatment facility self-reported that information, as required by its Tennessee Department of Conservation permit. And now the Tennessee Clean Water Network, an independent environmental advocacy group based in Knoxville, has filed notice of its intent to sue the city over those violations of the Clean Water Act. "The outcome we're hoping for is that the city will make the necessary improvements to the plant and the collection system," said Renee Hoyos, executive director of the Tennessee Clean Water Network. A spokesperson for Mayor A C Wharton's office said public works officials weren't able to talk about the case since it's a pending legal matter, but confirmed that the city is working with the Environmental Protection Agency to remedy the problems. The raw sewage that leaked during the overflows contained all sorts of pollutants, including E. coli, parasitic organisms, intestinal worms, and inhaled molds and fungi. "Some sewage waste comes from household stuff, like your cleaning chemicals that you dump down the drain," Hoyos said. "If you painted your living room and washed your brushes in the sink, that's in there. If you dump pills down the toilet, that's in there." Hoyos isn't sure what caused the overflows, but said some are likely caused by aging infrastructure. The M.C. Stiles plant was built in 1977. "The trunk lines collect all the flushes, and the pipes are very old," Hoyos said. "They break like anything else, and they get worn down or clogged up with grease. Sometimes they get crushed by traffic." The clean water network alleges that not only has the M.C. 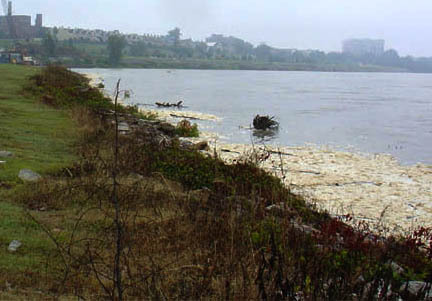 Stiles plant caused numerous illegal overflows, it's also been discharging white floating foam into the Mississippi River. "The white foam is caused by phosphorus and that comes from cleaning products," Hoyos said. "Soap companies add phosphorus to make soaps foamy, but when discharged into the Mississippi River, it's contributing to the dead zone in the Gulf of Mexico." In addition, the clean water network alleges that the M.C. Stiles plant is bypassing necessary treatment mechanisms before discharging waste into the Mississippi River. Though the plant is permitted to discharge treated waste into the river, a local kayaker has photographed solid materials, such as condoms, in the effluent discharged from the plant on several occasions. Proper treatment removes such solids from the waste. "There's a lot of people in Memphis interested in making Memphis a place where you can recreate outdoors instead of having to drive to White River in Arkansas," Hoyos said. "But you can't put a canoe in the Wolf when millions of gallons of sewage are being leaked into it."